My name is Stephen Rhodes. I live in Knoxville, TN. I've been playing, singing and writing songs since teen years. I had a whole box of lyrics about girls and cars. I have two professionally recorded albums-"Stephen Rhodes", released in 2002, and "Going Home", released in 2005. 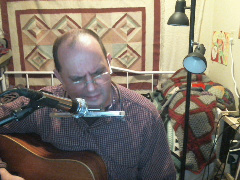 I play guitar, mandolin, piano, and harmonica. 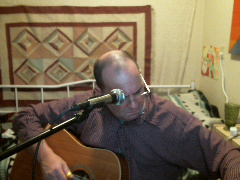 My music is available on www.cdbaby.com/stephenrhodes. 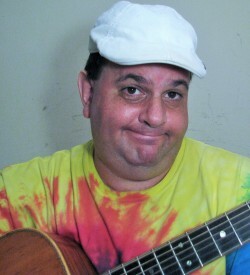 I also have a website www.stephenjrhodes.com, where you can hear my music. I believe Bob Dylan's "Highway 61 Revisited" may have got me hooked on music. My mom had the album on lp when I was eight years old, and I've been listening to the album ever since. Other big influences: Led Zeppelin, Mississippi John Hurt, Doc Watson, Neil Young, just about all the great early 20th century blues greats, Jelly Roll Morton, The Band, The Beatles(of course), Jimi Hendrix, Big Band Music. I love a lot of music. I'm looking forward to playing on StreetJelly! Gotta say, it's not a real fun story, to be honest. I was once kicked out of a venue. A friend of mine recruited me to guest host an open mic night he was hosting at a sports bar about seven years ago. When I showed up at the venue with my gear, the manager didn't seem to know anything about it. I guess my friend forgot to tell them about me. He wasn't real friendly about it either. "Jimmy didn't tell me nuthin' about this", he muttered in a rather surly tone. 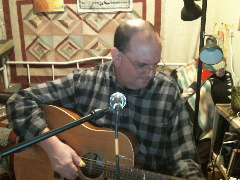 However, I was allowed to set up my stuff and play awhile before I started with the open mic night. But the hostility and general bad feeling in the place was palpable. Needless to say, I began to feel extremely uncomfortable.Then, after about 45 minutes, suddenly my p.a. was cut off, the house music started blaring, and the manager told me he wanted to speak to me. He told me that the other manager thought I sucked, and that I was driving people out of there. He made no attempt to be nice about it. Tough business.Still playing! What happened to my first guitar? Don't really remember. My first guitar was a red acoustic guitar I didn't even know how to play? I would pretend play when I was about 13. My mom bought me a guitar when I was 14-a plywood guitar by the name of Ventura.